According to numerous surveys, most people would rather face death than make a speech. How about you? 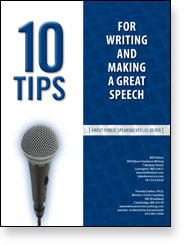 Whether you’re an experienced public speaker looking to sharpen your skills or new to the podium, I guarantee “Ten Tips for Writing and Making a Great Speech” will make the entire process more enjoyable than a typical firing squad. Simply fill out the form below.